Put your skis on your pack without taking it off, using one of two ski carry systems. Choose from a square hook to secure your skis or wrap-around webbing and clip. Velcro side pocket is designed to store crampons for easy access on the fly. Mesh shoulder straps and back inserts keep you ventilated while working hard. Ski carry loop has a nice plastic sheathing to keep it wide open and resist fraying. Internal sleeves are designed to keep your shovel and probe from sloshing around. Team tether system lets you tow your partner if he or she is holding up the show. Removable diagonal ski carry system is also included if you need to carry his or her skis. The backpack is hydration sleeve compatible or you can attach a bottle holder. Mesh pockets on the shoulder straps are great for gels or false idols. An ice axe can be attached with the partner ski carry loop and an upper bungee. Please note the lower ski carry loop fits skis with tails up to 135mm wide and is not adjustable. For the latest iteration of this classic design, check out the Rapid Racing pack. Notes Additional partner ski carry. I have had this pack for two seasons and use it for races and routine backcountry use- it is my "go to" pack for day long outings. It gets used a lot. Pros: It has stood up to the use extremely well only showing signs of wear in little pin prick holes from ski carrying. The velcro closure on the quick access "crampon pocket" is pretty secure and easy to close with a flip of the wrist with the pack on. I have only had it pop open once. The volume of the pack can take everything you need for a light and fast type of day, even a long day. Ive even done an 18 hour day that obviously required a lot of liquid and a pair of running shoes which all fit in it (barely!). It can carry boots if you clip them into your ski bindings and carry that way. The pack is very light and carries well. 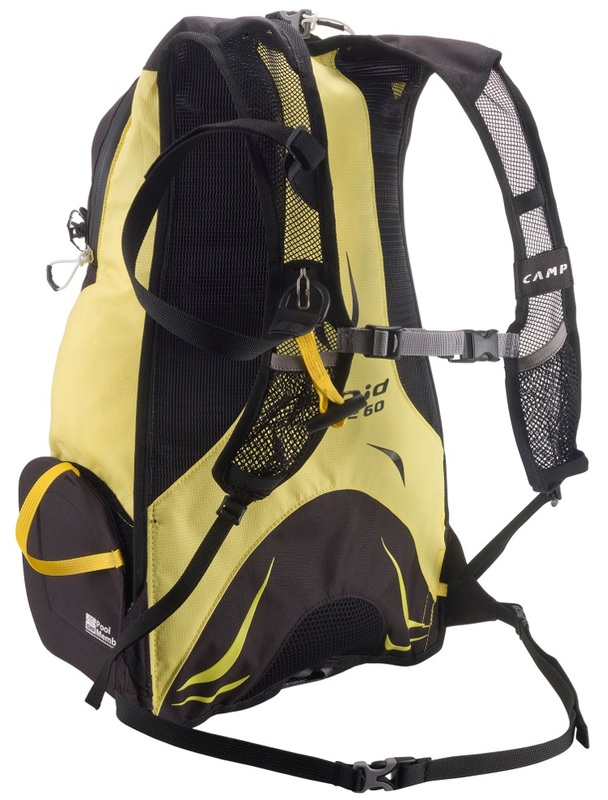 It mounts one CAMP water bottle holder on the left shoulder strap. The zipper and buckles have not failed. Cons: The ski carry loop is really big for skimo skis and the bindings can slip through the loop. Wrapping tape or better yet, zip ties around the loop to choke it up some fixes this. The ski carry upper strap has a plastic D ring that attaches to the xpress clip which generally works well. There is an optional ski hook attachment which looks cool but should be thrown in the trash immediately. My buddy lost his skis on a boot pack with this thingy- brutal! The Plastic D ring eventually broke but I retrofitted it with an old beefy key ring I had around and that has worked great. The ice axe lower loop is way too big and an axe gets sloppy in it. You can tie it shorter. The upper shaft attachment is very poorly thought out. It is elastic so if you cinch it tight and the axe gets jostled as inevitably happens, it loosens up a good bit. Replace the wimpy sliding lock mechanism and elastic cord with small diameter static cord and a normal cord lock toggle and you will fix this issue too. One last thing, you can only really fit a very small shovel in this pack. Bottom line, a pretty solid pack at a good price that, with a few tweaks, looks like it will stand up to a lot of use for a long time. One thing I forgot, the partner tow strap requires you to add a carabiner to it. It works as well as you might want- Ive towed partners on some pretty long hauls with it during team races. I've this pack now for about a year. I'll use it for skinning up the resort and for quick backcountry trips in Colorado. 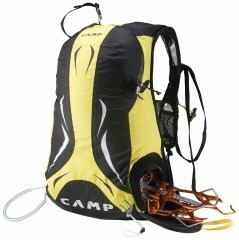 It's also great as a day pack for skiing on multi-day hut trips. Very light and well thought out. It can be a stretch to get everything in there you would need for a day trip, but with thoughtful packing, it all fits. Be careful with packing anything sharp. First time out, the pointy end of my probe put a small hold in the pack. Also, the pack straps do get twisted up and the buckles are small so they can be difficult to handle with gloves on. Also, can't speak to its waterproofness, since we generally have dry conditions out here. Overall, though, any weaknesses are outweighed by the weight savings. I'm on my second CAMP race pack and, as with much other race gear, I would say it performs very well for it's intended purpose. I keep this pack in reserve for racing, already packed up with shovel, probe, spare clothing, and emergency blanket. Space is not an issue in races so no problem there. It is actually usually pretty empty. Some sort of simple compression system would actually be nice to keep it all tight to the body. Ski carry system works well. The hook is not attached to a bungee and is slightly lightweight compared to the Dynafit hook. I have had it pop off my skis if I am not careful putting it on. If you are careful it works fine. My skis stayed on in every individual race last year and running up the entire Mt Rainier boot pack. Tail loop is adjustable (unlike the Dynafit RC20) so if you have a slightly bigger ski, you can make it bigger and still use the pack. Ice axe attachment is not terribly confidence inspiring but I have not had it rip off when carrying a CAMP Nanotech axe. A pair of ice tools would be a different story I suspect. Crampon pouch is fine and plenty of room for even big rigid crampons. Make sure to grab the bottle holder attachment as well as it is not included like the Dynafit. Summary = Very light. Reasonably durable. Comfortable. Use it for racing/training and find a slightly bigger/more durable/water resistant bag for touring. Overall: Five Stars for a skimo race pack that is pretty much perfect for, well, skimo racing! Also great for ski touring when you don’t need to carry sharps or any other hard objects (for which better choices are available, including CAMP’s own Rapid Racing). Fine for off-snow uses too, although probably would flop around a bit too much for really fast trail running. Background on product familiarity: I bought my Rapid 260 pack in Fall 2011 and have used it for many hundreds of thousands of vertical feet since then. First, the first impressions out of the box: Something this light and seemingly insubstantial is really a fully functional 20-liter backpack? Yes indeed! CAMP has pared the weight down to almost nothing, yet somehow included many highly useful features, e.g., quick-attach system for skis, side-accessed lower compartment, mesh pockets for gel packets, partner towing system with included elastic tow line (though faster partner is not included). But how to attach an ice axe? I have the official instructions, although for some reason my copy from 2011 is entirely in French. Maybe something was lost in translation, but even the pictures don’t inspire confidence. Plus many other competing models are better for carrying sharps, including CAMP’s own Rapid Racing. Second impressions, in use: Everything works very well as designed. Only drawback is that the back is designed for ventilation, so when I used it in a very wet snowstorm, the contents got damp (though I was pretty damp too). And the shoulder straps can get confusingly twisted up sometimes when putting the pack back on, but you hardly ever need to take the pack on and off. Third impressions, for long-term durability: The only durability issue I’ve experienced so far was from some serious overloading beyond its intended application … I had skied the Mt Adams SW Chutes then climbed back up to Lunch Counter, and was able to ski almost all the way back to the trailhead – on the second-to-last day of July! To do it all over again the next day, I had only a 35-liter pack intended for carrying both skis and boots on my back, but now knowing that I had no need to do that, hmm, could I carry everything for a big day in my little Rapid 260 pack? Yes, but I carelessly placed a metal shovel shaft right up against the inside of the fabric section where my skis would sometimes be rubbing against on the outside. Even with such a torture test, the abrasion was very mild, and with a combination of duct tape and seam sealer the pack is still fine now over two years later.